​Is Your Child's Heart Healthy? EVERY DAY over 30 children suffer a Sudden Cardiac Arrest (SCA) in this country. Every three days, it happens to be another “perfectly healthy” high school child athlete that dies from an SCA while playing sports, marching with the band, or even following Physical Education class. Avoiding those heart-breaking deaths is possible with a simple heart screening. LOWCOST / FREE (donations requested) heart health screening for students, athletes and young adults ages 10 and up are possible through the Anthony Bates Foundation (ABF). Sharon Bates, whose 20-year old college football-playing son died from a sudden cardiac arrest, helps parents avoid the heartbreak she and other parents have experienced by offering cost effective heart screenings in the Fall 2018. Anthony’s death could have been avoided had there been cardiac screening programs available twenty years ago. 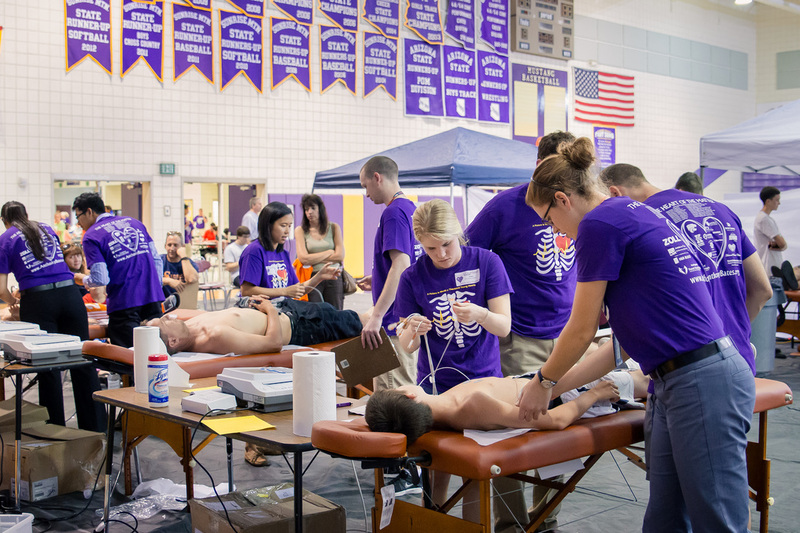 In the sixteen years of conducting screenings, consistently, one out of eight student athletes are found with a detectable, sometimes serious, treatable heart conditions. MORE Summer & Fall 2019 events are to be announced soon! 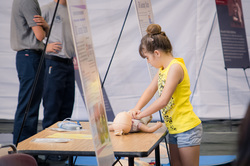 The painless, fast screenings check children for heart conditions leading to Sudden Cardiac Arrest (SCA). Too many times the news media carry stories of an apparently healthy student athlete dying on the playing fields. This parental nightmare becomes even worse with the knowledge that the cause of death is detectable, and lives can be saved with advanced knowledge and sometimes simple lifestyle changes. Knowledge is the power to prevent SCA. Appointments for specific times may be reserved on www.AnthonyBates.org event page: Events. Pre-registration and a small fee is required at the time of registration. 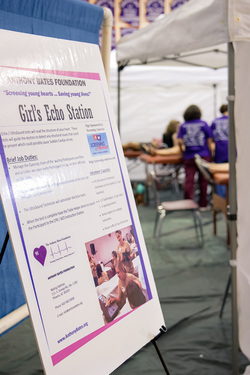 The leading killer of young athletes is a condition called Hypertrophic Cardiomyopathy (HCM) or “enlarged heart.” The Anthony Bates Foundation targets young athletes to help prevent these unnecessary deaths. 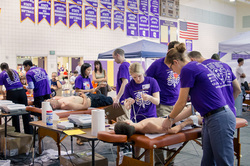 With its cadre of sponsors, volunteers, and volunteer nurses and cardiac physicians, the Foundation with the support of our sponsors will perform for cost effective screenings that could cost as much as $1,250 for an Ultrasound (also known as an Echo or Echocardiogram,) a $500 Electrocardiogram (ECG also known as an EKG) with additional charges for a cardiologist review. 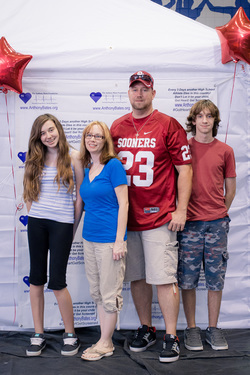 Donations and sponsors help offset screening costs for the Foundation. While there is a small charge for the child heart screenings at this event, these tax-deductible contributions to the Anthony Bates Foundation range from $25 to $165 (depending on type of screen & available sponsorship) to help fund screenings for more children & families. 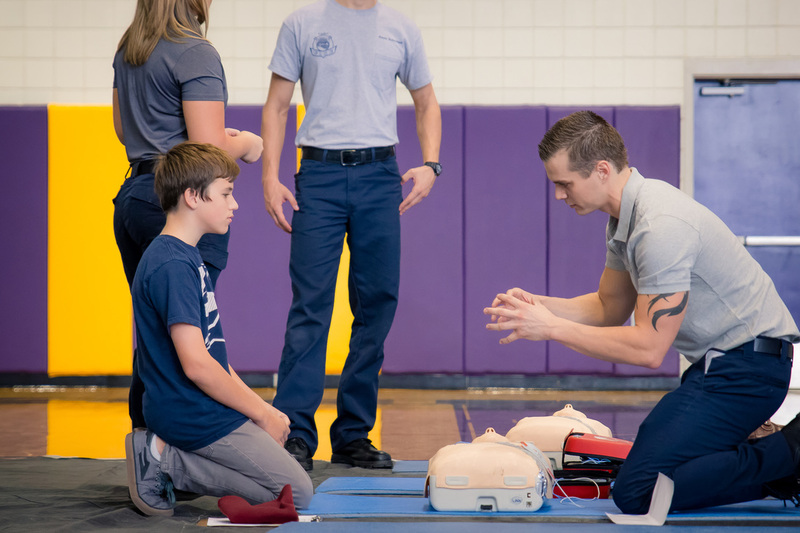 Contributions at the 2018 / 2019 Heart Health screening AED Fundraisers will assist ABF with the purchase of Automatic External Defibrillators (AED) for the area schools. 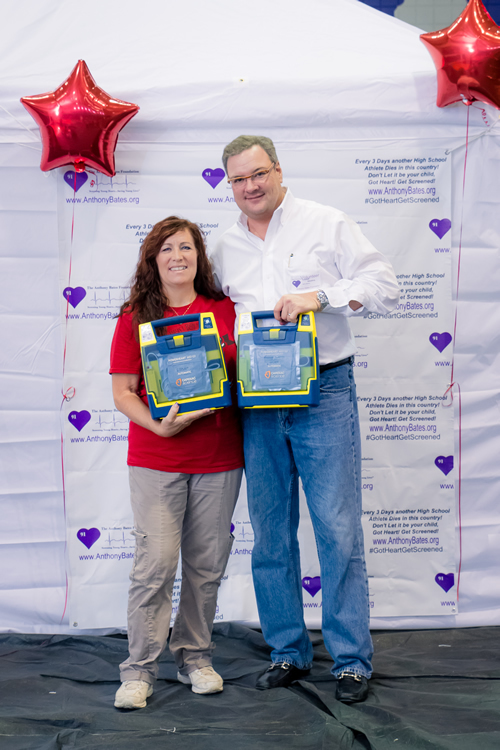 AEDs have saved countless lives across the country, and dozens of lives have been saved at Sky Harbor Airport where AEDs were installed in 2008. Please, go to our pre-registration webpage (www.anthonybates.org/events.html) or our donation webpage (www.anthonybates.org/donations.html) to donate, or provide your contact information for the screening events in your community. Phoenix, Arizona– Sharon Bates, Founder and CEO of the Anthony Bates Foundation (ABF), was named the 2015 Beth McDonald Woman of the Year at a beautiful ceremony at the Hyatt Regency Scottsdale Resort & Spa at Gainey Ranch on Thursday evening. The award is presented annually to one extraordinary woman who has made a difference in the community. The annual Beth McDonald Woman of the Year Award “recognizes amazing women from all over the Valley. From CEO’s to Soccer Moms, KEZ and Beth look for these women and select one special woman each month to be highlighted.”These 12 unique women have demonstrated exceptional leadership qualities that have made it possible for them to pave the way for a better world. To win is truly an honor. Sharon Bates was the Honoree for March 2015. After losing her only son Anthony to an undiagnosed congenital heart condition called Hypertrophic Cardiomyopathy (HCM) in 2000 at just 20 years old, Sharon dedicated her life to raising awareness, identifying heart conditions and preventing Sudden Cardiac Death (SCD) in other children by founding the Anthony Bates Foundation in 2002. Sharon’s vision to educate and identify undiagnosed heart conditions in other youth has been the catalyst for hundreds of heart screening efforts across the nation and the world. In addition, ABF has placed approximately one hundred automatic external defibrillators (AEDs) in schools across the country. She is co-founder of Parent Heart Watch (PHW), a national organization of families, survivor, physicians and medical workers with a similar passion to save lives. For more information about the Beth McDonald Woman of the Year Award, please visit http://www.kez999.com/common/i-nominate/woman-of-the-year. The Anthony Bates Foundation (ABF) is a 501 (c) (3) non-profit organization formed in 2002. ABF is dedicated to saving young lives through early detection of Hypertrophic Cardiomyopathy (HCM). Their goal is to promote heart health education and awareness of HCM. Through public outreach programs and heart screening events, ABF focuses on education and awareness for healthy hearts. ABF believes that no parent should suffer the heartbreak of losing a child to an undiagnosed cardiac malady. To learn more about ABF, visit http://www.anthonybates.org. Throughout the first half of the Suns season, local non-profit organizations that serve children and families in Arizona were encouraged to apply for this year’s “Charity Challenge” program, which began with the organizations selecting Suns games they wanted to attend between November 4 and January 6. Organizations requested tickets in blocks of 50, and became eligible for tonight’s drawing by maintaining a show rate of 90 percent or greater at their respective game. The Suns donated nearly 9,000 tickets to 70 local non-profits over the course of the program. Representatives from each of the qualifying non-profits were joined by Suns President Jason Rowley, Phoenix Suns Charities Executive Director Sarah Krahenbuhl and the Suns Gorilla for tonight’s on-court recognition. In addition to receiving the $25,000 grant, Suns representatives will visit the Anthony Bates Foundation at a later date to highlight the great work the organization does and how the grant will be used to improve the community. Suns Charities has been focused on making our community a better place since 1988. 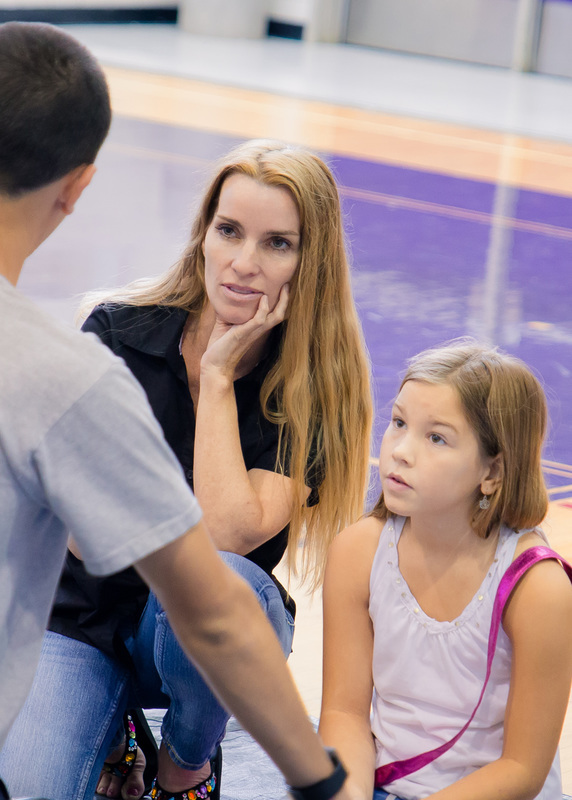 Since its inception, Phoenix Suns Charities has invested more than $17 million in our community. The Suns’ philanthropic arm enjoyed another strong year in 2015, raising more than $1.1 million for Arizona non-profits.